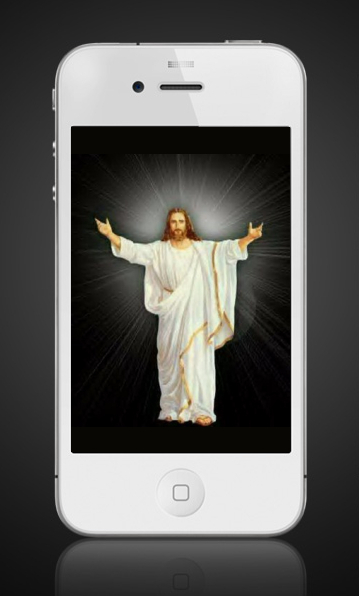 Would Jesus have an iPhone? In my opinion, there are those that embrace change, and those who shun it. When it comes to cell phones, I have unabashedly shunned change. I am legendary for it. When I had an old school Nokia phone, I was the one that didn’t want that newfangled Blackberry that Oprah was talking about. I distinctly remember her showing one and thinking, oh no, I will never need one of those. I have a cell phone and a Palm Pilot and that’s all I need. Then I added an MP3 player to my collection. So I walked around with three gadgets on me all the time, never knowing that there was a better way. Then Lynn got his first Blackberry, and he shamed me consistently as I carried around all my gadgets. I fiddled with his phone and I just knew I’d never be able to figure it out. I was content to only have a cell phone that made phone calls and texts. I didn’t need a calendar, I didn’t need email. I didn’t even know about Facebook back then, I felt guilty about starting my first Myspace page. I imagine I would have been the one fussing about the arrival of the television and yelling about it being a devil-box. And then the advent of the iPhone… Katy bar the door. All-out war was declared in my home. I had finally graduated to Blackberry, Lynn was getting his MBA in iPhone. What is it that makes some of us really uncomfortable with change; especially technological progress? And why is it that the Church seems to be the first group to start the riot? I really don’t get it. The Church should be the ones with the most forward thinking. They should be leading the charge of living better, living smarter, living cleaner, living healthier… the Church should always be doing it better, not doing it the old school way. I think maybe we get forward movement confused with spiritual backwardness. Jesus totally would have had an iPhone. Today I am going to find a very cute case for my very cute new iPhone. And I’m going to make a concerted effort to open my circa 1972 eyeballs and see opportunities to do things better. I don’t want to be the reluctant one, I don’t want to be the one that has to say that I finally saw the light and bought myself one gadget that took the place of three. I want to be ahead of that curve. I want to see opportunities instead of roadblocks. The Bible tells us in Matthew 10:16, Behold, I send you out as sheep in the midst of wolves. Therefore be wise as serpents and harmless as doves. It doesn’t say watch out for change and avoid it at all costs. It just says, “Be wise!” Lord, help me to see the difference! Love it. Welcome to the club! Don’t feel bad, Juli. I have an iphone, ipad (with a cool keyboard), netbook AND pda; three desktops, a vcr in every room and only one dvd player. When I travel I take my iphone, ipad AND netbook. Figure I won’t need my pda. I guess I think I will need it again someday…lol. All joking aside I hear what you are saying about change and the need for the church to move forward in thinking first. I think that change in the minds of people as a whole is never easy. As I get older I make myself embrace changes because I find it becomes easier to do less with what I already have and I do not want to find myself stuck in a chair physically, mentally or spiritually and missing out on fulfilling my purpose in the earth. I enjoy your musings and find them beneficial. I don’t know… I totally am with you on the point that Christians should not be resistant to the idea of utilizing new technological tools to make our lives easier and to help us be better stewards of our time and more effective ambassadors of the Kingdom, but I’m not sure how interested Jesus would have been in a smartphone. I’m trying to picture first-century incarnate Jesus in the 21st century, which is really no easy task… I think, though, that the essence of who Jesus was on the Earth was God reaching out to human beings, whether one at a time or in larger crowds (sometimes both, as in the situations where Jesus was in a large crowd and wound up ministering to an individual right then and there). I do think 21st century Jesus would have a cell phone, because I think He would want for people to be able to reach Him, but somehow I doubt He would have much interest in more solitary things like getting on the Web or playing Fruit Ninja. I feel like He would be more interested in having people come to Him, not so much reaching out to people via a blog, podcast, Facebook page. Really, Jesus seems to have done very little self-promotion… He was more likely to instruct people to NOT tell their friends about Him than to advertise. I don’t know that He ever had enough of an itinerary planned out ahead of time to need a calendaring app. I’m guessing that Jesus enjoyed music, although I can’t off the top of my head point to chapter and verse on that, but I wonder if He would be interested in plugging in earbuds and listening to music by Himself, or if he would prefer music in a more social setting where He could be with His loved ones and followers. Now, I could TOTALLY see Peter with smartphone in hand and earpiece in ear, talking into his sleeve and trying to hustle Jesus around to different appearances and events. I don’t at all think Jesus would discourage Peter (or us) from using a device to stay organized, keep in touch with people, or even just to relax and enjoy a game of Angry Birds every once in a while.